My husband has a monthly get together with some of his friends for a guy’s night out. This has been going on for a while, but for some reason I got it in my head that I needed to bake something for his most recent guy’s night out. Something manly. Cupcakes taste great, but I really couldn’t picture a bunch of guys sitting around eating cupcakes together, you know? I am not a genius, nor am I the first person to ever attempt putting bacon in a chocolate chip cookie. Why? Because I love salty sweet snacks, chocolate chip cookies, and bacon. So really the question is, why not? I used my all time favorite chocolate chip cookie recipe for these, and I’ll warn you, it does take a little bit of planning ahead. You need to let the dough rest in the fridge for 24-36 hours. No, this is not some new form of torture. I assure you it does make a difference in the taste of the cookies and it is worth it. 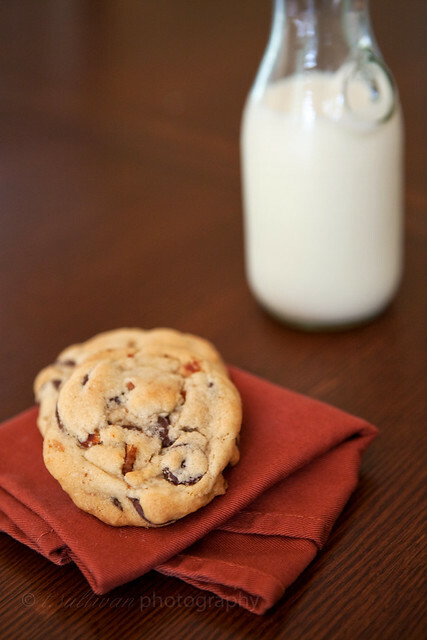 If you too love salty sweet foods, chocolate chip cookies and bacon, you owe it to yourself to make these cookies! Just make sure you share because there’s nothing low fat, light, or healthy about them – just the way I like them. While the 24-36 hour rest period is important for creating great flavor in these cookies, I didn’t want the bacon to sit in the cookie dough that long. I was worried it would lost it’s crispness and leach salt into the dough, leaving me with overly salty cookies. Folding in the bacon at the last moment before baking avoids this problem and yields nice crisp bacon pieces in the cookies. When dough has warmed enough to be pliable but not too soft, fold in chopped bacon. Using a 2 tablespoon cookie scoop, measure 8 cookies out on a baking sheet. Bake one sheet at a time, 15-20 minutes or until edges are starting to brown. Cool 2-3 minutes on baking sheet, then transfer to a wire rack to cool completely. Strong enough for a man. But delicious enough for a woman. I like the way you think. Who would ever think to combine a delightfully cooked bit of swine with a chocolate chip? Go figure… The best of both worlds brought together to create brilliance! Oh my, this sounds like my kind of cookie. Hmm. I think I could get into this twist on my favorite cookie. I know my son would LOVE it. Hmm, I don’t know. I’ve never really gotten into this bacon in dessert craze that seems to be going around. But I do love bacon and I do love chocolate chip cookies, so I would still give it a try. 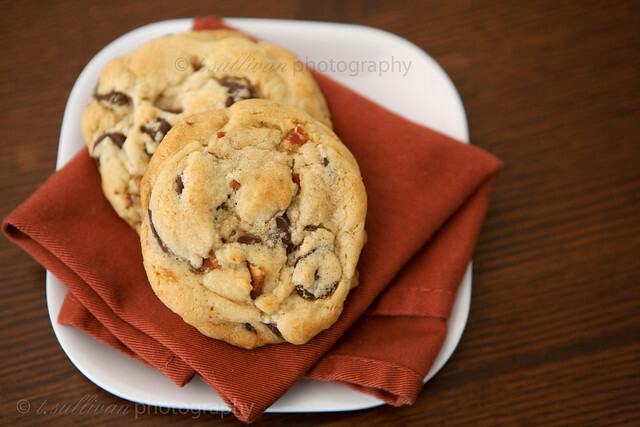 And this is definitely my favorite chocolate chip cookie recipe so next time I make it, I’ll slip some bacon in a few of the cookies before I bake them! Wow, what delicious-looking cookies. I love sweets, and these cookies look mouth-watering! I usually stick to these Brownie Cookies – http://www.recipe4living.com/recipes/brownie_cookies.htm – They’re pretty tasty too! My husband always pours syrup over his bacon so I think he would like these even though I also think he would be reluctant at first. This isn’t the first time I’ve heard of this combo either. I’ve just never had the guts to try it. The more I think about it, though, the more those need to be in my stomach. did someone say bacon? and chocolate chip cookies? what’s not to work about this recipe?! ;) yum-yum! Unbelievably, my boyfriend is expressing skepticism. Sweet and salty? Bacon and chocolate? How could this not be awesome?! This sounds and looks awesome! I think I might make these for my Saturday morning tailgate. Thanks for sharing and glad I could find your blog through FoodPress. everyone has been telling me chocolate and bacon go so well together. this might be the first thing i make with chocolate and bacon because the ingredients look good and the pictures look better. THANKS! I’d be in the former camp, as in, Awesome, You’re a Genius. I have to try these. Ok, I admit that I’m a little skeptical, but I know my boyfriend and his daughters would be all over this one. I guess I’ll have to give it a try. Thanks for the recipe! Yeah youre right we love cookies and bacon, combining them would be heavenly! This is a definite must try specially when the boys are visiting our place for a game. Thanks for sharing it. This looks interesting. I’ve never had bacon in cookies. But I love bacon and I love cookies. HA! So may be worth a try. What a strange combo but I would be up for it. Who doesn’t like salt and sweet together? Well the question is (and it might sound stupid), but what kind of bacon are we talking about, and do I have to fry i before I put it in the dough? It’s not a stupid question! I edited the recipe to eliminate any doubts, but you should definitely use cooked bacon in this recipe. I cooked up a pound of my favorite kind (center cut slices from pork belly) and used 6 of the leftover slices to make these cookies. After a quick look at Wikipedia I realize many countries have a different version of bacon than what we Americans traditionally call bacon. If that’s the case in Denmark and you can’t find anything similar to sliced pork belly, you can probably substitute another salty, crisp cooked meat such as panchetta. The highlight of these cookies is the contrast of the salty and sweet so as long as you can replicate that you should still enjoy them! This reminds me of the bacon-chocolate bars available at Fresh Market. yum! I will have to make these for me and hubs! Thanks for the post! Such a creative cookie. hi. was wondering if you refrigerated any leftover cookies? i made some bacon peanut butter cookies but i’m not sure if they need to go into the fridge after baking or not!